Last month, my wife, kids and I were in Southern California for a week long family vacation. Our first stop wasin Sherman Oaks at the Van Eaton Galleries, which was featuring amazing collection of Disneyland memorabilia. Here's a link to the previous post with more information on their auction. The Van Eaton Galleries is located on Ventura Blvd. 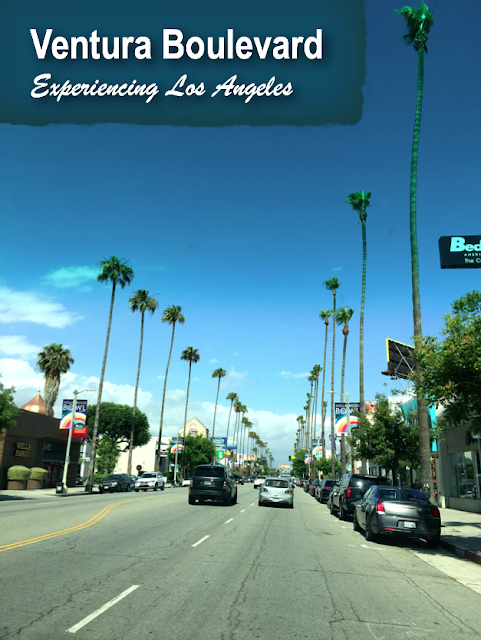 Rather than get back on the Freeway, we opted to drive on surface streets over to Hollywood, where we were spending the night. When we lived in Los Angeles, I posted photos of urban walks along Wilshire, Santa Monica, and Pico Boulevards (starting at the ocean, and heading inland) as well as part of Main Street in Santa Monica, Abbot Kinney in Venice, and Sunset Boulevard in Silverlake. Pictured above: we were only walking back to our car - and would then be driving along Ventura Boulevard. My son, now 17, wanted to drive. How about if I just snapped some photos along the way? That's what we did. Ventura Boulevard is 18 miles long. It begins to the west at Valley Circle Blvd in Woodland Hills, and ends at Lankershim in Studio City where it becomes Cahuenga Boulevard. It's a couple miles longer than it's more famous cousin on the other side of the hill, 16 mile Wilshire Boulevard (which runs from Downtown Los Angeles to the Pacific Ocean in Santa Monica). Leaving Sherman Oaks and entering Studio City: the communities changed at Dixie Canyon. This is a block up, between Nagle and Fulton. This is between Alcove and Goodland - the Sportsman's Lodge Hotel is immediately to the left. Here's something I didn't know: according the the Wikipedia article, Ventura Boulevard is the longest avenue of contiguous businesses in the world. It also feels very, very suburban. This is the intersection of Ventura Boulevard and Laurel Terrace Drive to the south, Whitsett Avenue to the north. While I'm no expert on the history Ventura Boulevard, the vast majority of the businesses along the way looked like one story mid-century era buildings. A huge plus is that most business face the street - rather that a large parking lot around back. A few feet up, past the intersection, the view is longer obscured by the traffic light. I love this view - with the long row of palm trees on both sides of the street. This really says Los Angeles. Businesses, palm trees, and cars. On the other hand, this was a Sunday afternoon, with relatively very light traffic. If Ventura Boulevard is anything like other major arteries in Los Angles, my guess is that this is a tough slough during rush hour. In Los Angeles, "rush hour" is from 5am-10am, and then 3pm-7pm. However, L.A. rush hour can extend until 11am the morning and 2:30pm-9pm at night (meaning rush hour can last over 12 hours per day). As a Christian, I hope my faith influences everything in life, even on something as mundane as the infrastructure of a city. Obviously, urban planning is not my career choice, but it's something I'm still interested in. Christians speak of "human flourishing". This comes from the greek word eudaimonia, meaning happiness or welfare - an idea that originated from Greek philosophers. I like this quote from Yale University: "Concern for human flourishing is at the heart of Christian proclamation. Theologians have long proclaimed that the very heart of a Christian’s hoped-for future, which comes from God, is the flourishing of individuals, communities, and our whole globe." Above: Ventura Boulevard at Laurelgrove. Ventura Boulevard follows the original El Camino Real, the 1771 era road connecting the chain of California Missions from San Diego to Sonoma north of San Francisco. This would make Ventura Boulevard one of the oldest roads in Los Angeles. Most of this area was zoned, in this case for commercial, during the post World War II building boom of the 1950's and 1960's. "Human flourishing" at that time no doubt involved communities built around cars. The idea of a walkable city meant density - which, was seen as a throwback to the 19th century urban problems of places like New York or Chicago. Los Angeles' post World War II urban planning may have seemed forward thinking at the time, but there's certainly an sense of short sightedness as the city has continued to grow. This is between Lauralgrove and Vantage Avenues. Most of the San Fernando Valley, or "The Valley" as it's comonly referred to, is within the L.A. City limits. Like other parts of Los Angeles, the Valley is made of long east/west, north/south streets and avenues. In that sense, Studio City is similar to other communities in the Valley. Ventura Boulevard at Colfax. Surprisingly, the Los Angeles River is literally a few hundred feet from this spot - it parallels Ventura Boulevard for several blocks beginning at this spot. In addition to it's proximity to the Los Angeles River, what makes Studio City different from other parts of the Valley is the combination of high end homes (especially in the hills to the south) as well as the number of residents connected to the entertainment industry. Current and former residents include George Clooney, Miley Cyrus, Leonardo DiCaprio, Zac Efron, Neil Patrick Harris and William Shatner. Ventura Boulevard at Big Oak Drive. 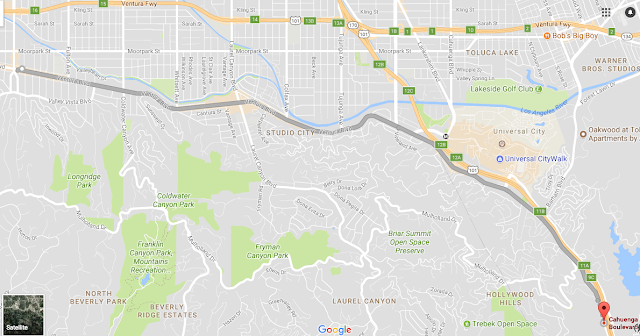 As a kid, most of my time in the Valley was in over Woodland Hills - also straddling Venture Boulevard, but on the western edge of the Valley. As a kid growing up in the 1970's, I have good memories of spending the night at my grandparents, and riding my bike in 100+ degree heat to Thrifty Drugs (now Rite Aid) on Ventura Boulevard in Woodland Hills for their 5 cent ice cream cones. You heard right: back in the early 1970's Thrifty actually sold a single scoop ice cream cone for 5 cents. This was a "loss leader" -they took a small "loss" on the ice cream as an incentive to lead people into the store. Worked for me! I LOVED going there. Got any "back in the day" memories from the Valley? Ventura Boulevard at Eureka. I like the way the road curves around the hugs the hills. Driving through the area, I was reminded of a friend and former co-worker (and his family) who moved to the area a few years back to develop a start a new church. I would add that starting a new church is extremely challening. "Anthology Church" is a non-denominational church meeting at the Studio City Rec Center (12621 Rye St) just a few blocks from here. Here's a link to their website. In the distance are two two office towers of Universal Studios. Immediately adjacent to Studio City is "Universal Studios, Hollywood." Except that Universal Studios Hollywood isn't located in Hollywood. It's located near Hollywood - in "Universal City" - an unincorporated area just outside of L.A. City limits in the Valley. Of course, in L.A. everything blends together. There's rarely any sense of leaving one city or community and entering another. Last January, my wife, kids and I were in Southern California and decided to visit Universal Studios for the first time. First time for them, I'd actually been before. It was honestly disappointing. You can read about it here. When we bought our tickets in January, we decided to spend a few dollars more an upgraded to "annual passes." That said, going a second time would be basically free, so - hey- why not? We planned to give Universal Studios another try the following day. With my son at the wheel, Ventura Boulevard turned to the right and became Cahuenga Boulevard at Lakershim - taking us through the Cahuenga Pass into Hollywood. Cahuenga, pronounced "Ka-wan-ga" is the short, low pass connecting Los Angeles Basin to the San Fernando Valley. It's really only two miles from the Valley over the hill and into Hollywood, really only a thirty minute walk (that is, if you can find a sidewalk). However, the topography and terrain really separates the two areas. ... until we hit complete gridlock just before the Hollywood Bowl. This being Los Angeles, we were suddenly stuck in traffic on a Sunday afternoon - with no explanation for why. After sitting in traffic for ten minutes and going no where, I had my son move over the left lane, make a slightly illegal U-turn and went over the overpass to the other side of the Hollywood Freeway. He's on his way to mastering L.A. traffic. For us, it was a ten minute inconvenience, but for a million or more Angelenos soul numbing traffic is a daily part of life. Los Angeles not only the distinction of having the worst traffic in the United States, but having the worst traffic in the world. Thinking back to human flourishing, high sight is 20/20. It's amazing, in a very negative sense, how sixty years ago the city fathers tossed aside thousands of years of urban planning experience in favor of a car-centered transportation model for a major city. Still no idea why traffic was that bad, but we went around it and 10 minutes later, we were at our hotel in Hollywood. More on that, and a tour of Hollywood Boulevard - on foot, rather than through a windshield - next time.